In IMTFI's PERSPECTIVES blog series, IMTFI fellows take on the recent demonetization move in India. This series aims to foster an open dialogue on issues around money, technology and financial inclusion for the world’s poor. Individual contributions reflect contributors' own reflections on recent events - based on their research and areas of expertise. The topic of demonetization will conclude with a curated commentary by IMTFI on key themes, important questions, and what we can learn from these contributions for digital financial inclusion going forward. It is now clear that a major objective of last November's demonetization initiative was to promote a cashless economy in a bid to formalize the economy, a large part of which escapes any form of taxation. This argument was very clearly made by Prime Minister Narendra Modi in his official speech of December 251. He claimed that bancarisation2 and digitizing payments would primarily benefit the poor, since it would end "labor exploitation" and give the poor better access to various benefits such as health insurance. Many reasonable doubts can be raised regarding such claims, starting with technical barriers to implementation (inadequate payment infrastructure, poor connectivity and access to power, etc.). 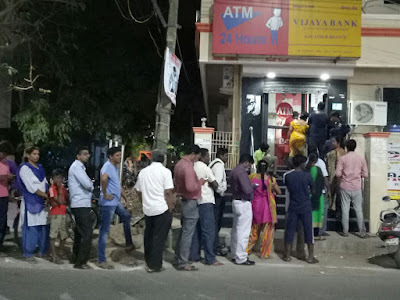 Our field observations over the past decade in various parts of North and Coastal Tamil Nadu help shed light on another cause for doubt: widespread distrust of banking and digital transactions (although there are distinctions between the two). Our ongoing fieldwork, which has focused on how ordinary villagers have been handling demonetization over the past two months, widely confirms this. The first part of this blog post discusses resistance to bancarisation. The second part questions the links between digitization and formalization. Many villagers engage in resistance to bancarisation, with good reasons. 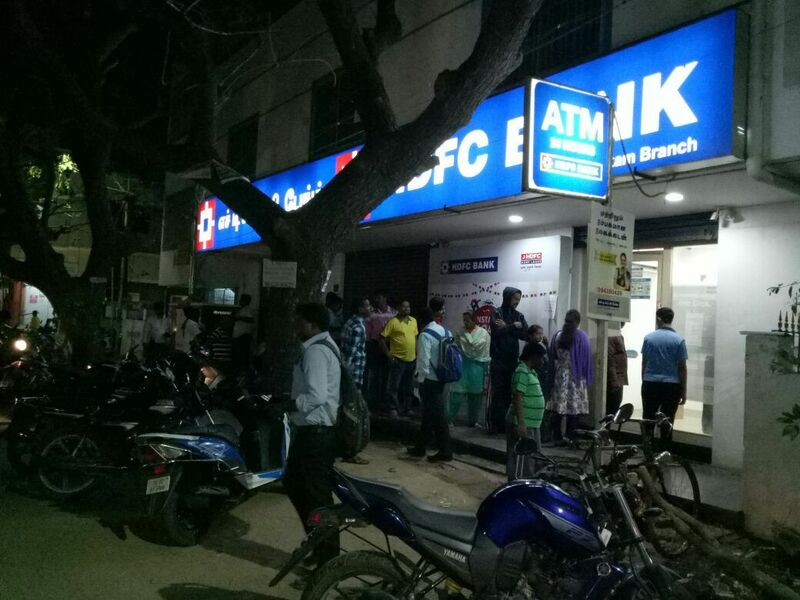 In the wake of various measures and governmental schemes over the last decade, the bancarisation of Indian citizens has made significant progress but remains largely incomplete. In our field area, almost all households have a bank account but many don’t use them, or only do so to channel their welfare benefits (which is the reason for the mass opening of bank accounts). Villagers are distrustful of bankers - who are unwelcoming to the mass of illiterate clients - and rely on other means to save. Gold purchases, informal loans and reciprocal gifts (mostly through ceremonial exchanges) continue to be the most popular way to save and protect against the knocks of daily life. As State social protection is almost non-existent, family and friend support networks for times of need continue to be the most important protection and means to plan for the future. Any monetary surplus is injected into this network through gifts or loans. Freezing wealth in a bank account makes little sense, barring the willingness to cut oneself off from one’s social surroundings. Demonetization, and banks’ inability to provide cash3 has further heightened mistrust. Apparently the few people who have a cash surplus are still unwilling to entrust it to banks (which in turn worsens bank liquidity shortages). Conversely, interpersonal relationship networks have partially helped to mitigate the drawbacks of demonetization. Since November 8, in our areas of fieldwork, some sectors such as the construction industry have been paralyzed. But many economic transactions have been continued on the basis of mutual trust and credit through deferred payments of wages and consumer good purchases. Shopkeepers were already used to selling on credit, which is a major source of client loyalty. Most have considerably extended repayment periods, and in turn enjoy credit facilities from their wholesalers. We encountered households who hadn't paid their shopkeeper for the past two months. Various arrangements have been made for wages, often combining payment in kind (for instance rice for landowners, free meals for restaurants) and delayed payments. Workers have little choice, but some view delayed payment as “forced savings.”Some financial circuits have stopped. For instance, door-to-door moneylenders have stopped collecting repayments and are waiting before disbursing new loans. The same goes for many microfinance organisations. Some have been offering cashless loans (wire transfer) but with little success so far. Women (the main clients) are afraid they won’t get their cash. And we indeed came across instances of banks (who are themselves running out of cash) refusing to disburse microcredit loans and giving priority to savers. Chit funds (local ROSCAs4) have been at a halt for a while and are slowly starting up again. At the same time, the lucky ones who are managing to get cash are regularly5 lending it to others. Ceremonial transactions, which make up a large share of households’ expenses, particularly marriages at this time of the year, have also involved various informal arrangements. Some events have been cancelled, often with serious consequences for the reputation of the family. Events that have gone ahead have often been scaled down (for instance, having the wedding at home instead of renting a hall) but multiple chains of debt have allowed the event to take place. Instead of bringing the traditional cash – gifts represent a major source of funding – guests simply give a pledge document to be honored once cash becomes available. Others promise to give more at the next ceremony. Social relations are truly being put to the test. Merchants or service providers, be it for catering, jewelry, saris, music, photography, or film, are agreeing to be paid later if they are able to afford it. Ceremonial organizers are borrowing from financial companies and negotiating for direct wire transfers to merchants and providers (and will themselves pay back later in cash). When the old notes were still in circulation, debt was increasing simply because people with a cash surplus were desperately trying to get rid of their old notes and lending to anyone interested. This led to a significant drop in interest rates (by half in the places we visited). Credit markets remain highly segmented, however. In places where borrowers desperately need cash, interest rates have shot up (see below). It is also worth noting that beyond a few service providers such as hospitals6, which were authorized to accept old denominations until mid-December, many other traders have continued to do so illegally, such as jewelers, currency exchange offices, alcohol retailers, etc., most often for a commission (up to 20% in the cases we came across). As usual, these kinds of informal arrangements also have a dark side. 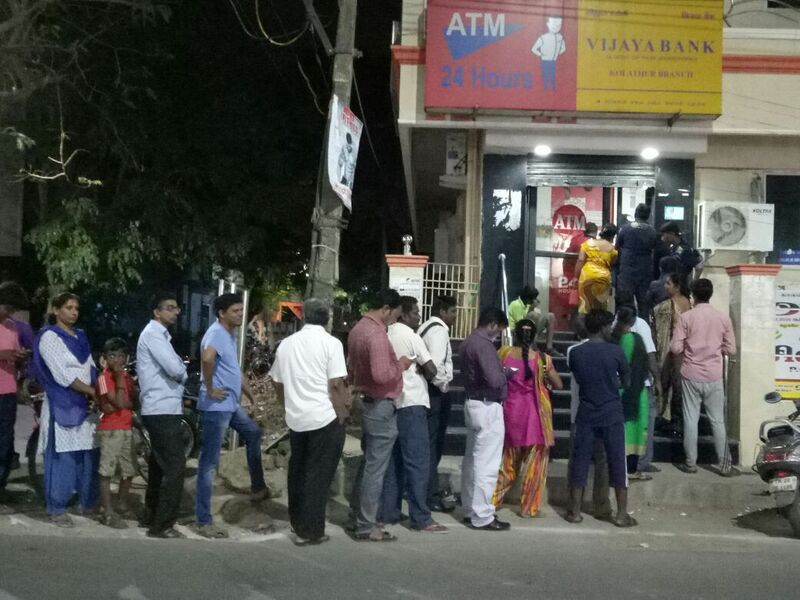 Intermediaries have sprouted up, offering high-cost services to queue at ATMs, deposit cash at bank branches, exchange the 2000 INR notes nobody wants, or simply to advance cash. Intermediaries are often to be found at pesticide shops, petrol stations, pharmacies, hospitals, and taxation departments. We also came across unscrupulous employers offering large advance payments to their workers in old denominations. Some accepted them, and have been struggling to get rid of these invalid banknotes. When the advance is for seasonal work that will start later in the year, some workers have cleverly accepted but with the deliberate intention of not turning up, arguing that the money they received has no value, and even though they have been able to use part of it. Some have refused for ethical reasons: they don’t want to be complicit in the whitening of black money. The strength of the rural poor's political awareness and commitment to the fight against corruption is astonishing. It is striking how much ordinary people have been affected by the demonetization and at the same time have support for it. But once citizens realize that it is merely an illusion7, the disappointment is likely to be bitter. In short, far from fighting it, demonetization has mostly caused a boom in the informal economy. What will happen in the future is of course a key question that we discuss in the second part of this blog post. Bancarisation refers here to efforts to include the unbanked in formal banking circuits and improve access to financial services. 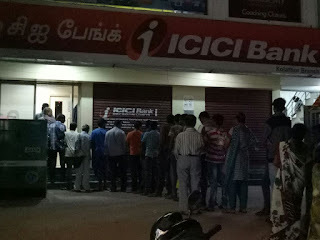 In urban areas in Tamil Nadu it seems that bank activities are slowly returning to normal. In rural areas, banks are still facing very serious liquidity shortages. As of early January, it is still common to see several hundred people queuing in front of a branch, from 8 in the morning and without any guarantee of getting cash. ROSCAS are rotating savings and credit associations. This is the case for civil servants, who are usually paid by cheque or wire transfer. In the wake of several public demonstrations, public administrations have organised cash payments for their staff. Petrol stations, highway tollgates and government cooperative stores have also been authorised to do so. Much black income is invested through gold and real estate. Fighting its cash component – which is less than 3% of the total black income according to certain estimates – would fail to eradicate the core of the problem, namely the generation of black income. See for instance http://www.caravanmagazine.in/vantage/demonetisation-arun-kumar-economist-black-money.